Slam Dunk (Japanese: スラムダンク, Hepburn: Suramu Danku) is a Japanese manga series written and illustrated by Takehiko Inoue about a basketball team from Shōhoku High School in the Shōnan area. It was serialized in Weekly Shōnen Jump from 1990 to 1996, with the chapters collected into 31 tankōbon volumes by Shueisha. It was adapted into an anime series by Toei Animation which has been broadcast worldwide, enjoying much popularity particularly in Japan, several other Asian countries and Europe. Slam Dunk has sold over 121 million copies in Japan alone, making it one of the best-selling manga series in history. Inoue later used basketball as a central theme in two subsequent manga titles: Buzzer Beater and Real. In 2010, Inoue received special commendations from the Japan Basketball Association for helping popularize basketball in Japan. 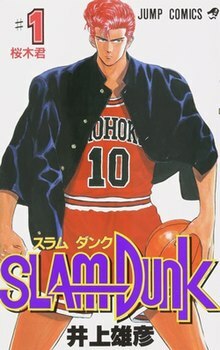 Cover of the first volume of Slam Dunk, featuring Hanamichi Sakuragi. Conquer the Nation, Hanamichi Sakuragi! Inoue became inspired to make Slam Dunk as he liked basketball since his high school years. After Inoue started Slam Dunk, he was surprised when he began receiving letters from readers that said they started playing the sport due to the manga. His editor even told him "basketball was a taboo in this world." Due to these letters, Inoue decided he wanted to draw better basketball games in the series. With the series, Inoue wanted to demonstrate the feelings from some athletes such as their thoughts when they win, lose or improve at their sport. When he started making Vagabond, he noted that when he was doing Slam Dunk he had a simpler perspective on life as he focused more in victories and success. With the series, Inoue wants the readers to feel achievements as well as love for the sport. Thinking that his success as a manga artist being largely due to basketball, Inoue organized a Slam Dunk Scholarship for Japanese students as he wanted to give back to the sport by increasing its popularity in Japan. However, when asked about the response from readers to basketball, Inoue commented that although Slam Dunk is technically a basketball manga, its story could have been done with other sports such as football. He also added that the artwork for the manga was very typical and mangalike in comparison to his newer works such as Real. His experiences with basketball also influenced the story from Slam Dunk: as a youth Inoue started playing basketball to be popular with the girls, but later became interested with the sport in and of itself. This was mirrored in the character of Hanamichi Sakuragi, who starts playing basketball to be popular with the girl he likes, to later become truly fond of the game. Written and illustrated by Takehiko Inoue, the series was originally published in Shueisha's Weekly Shōnen Jump from October 1, 1990 to June 17, 1996. The 276 individual chapters were originally collected in 31 tankōbon volumes under Shueisha's Jump Comics imprint, with the first being published on February 8, 1991 and the final volume on October 3, 1996. It was later reassembled into 24 kanzenban volumes under the Jump Comics Deluxe imprint from March 19, 2001 to February 2, 2002. A shinsōban edition began with the first six volumes all published on June 1, 2018. In North America, an English version of Slam Dunk was published by the now-defunct Gutsoon! Entertainment, which serialized the title in their manga anthology Raijin Comics from 2002 to 2004. Five collected volumes were published under Gutsoon's Raijin Graphic Novels imprint. They were released from July 2, 2003 until May 5, 2004. After Gutsoon! went out of business, the license for Slam Dunk was purchased by Viz Media, which published a preview of the series in the December 2007 issue of the North American edition of Shonen Jump. Slam Dunk began serialization in the magazine, starting with the May 2008 issue, as well as in tankōbon format with the first being published on September 2, 2008. As of December 3, 2013, Viz has published all 31 volumes of their translated edition. In 2004, Inoue produced an epilogue titled Slam Dunk: 10 Days After, which was drawn on 23 chalkboards in the former campus of the defunct Misaki High School located in the Kanagawa Prefecture, and was held for public exhibition for three days between December 3 and 5. The epilogue, along with coverage of the event, was reprinted in the February 2005 issue of Switch magazine. 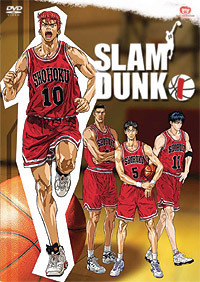 Cover of the first DVD from Slam Dunk published by Geneon and Toei Animation. An anime series, consisting of 101 episodes, was produced by Toei Animation and directed by Nobutaka Nishizawa. It was first broadcast on TV Asahi from October 16, 1993 to March 23, 1996. It was later aired on the satellite television network, Animax, in addition to four animated movies produced. The anime followed the manga storyline, but left out the National Tournament games. Toei compiled the episodes into a series of seventeen DVDs which were released in Japan from December 10, 2004 to May 21, 2005. Toei once again collected the series in three DVD boxes during 2008. All the three boxes have a total of seventeen discs. Toei and Geneon briefly teamed up to release the anime on DVD in North America after the manga was discontinued, though this was also discontinued after only a few volumes. The first DVD was released on March 15, 2005 and volume 4 was the last one released on June 14, 2005 before they were cancelled. Various episodes from the series were also downloadable in IGN's Direct2Drive service. Toei is currently streaming episodes of the series online for a fee and for free through Crunchyroll. Joost also started airing all 101 episodes as of May 2009 on their website. The music was composed by Takanobu Masuda (from episode 1 to 61) and BMF (from episode 62 to 101). Three CD soundtracks were published during the airing of the series in Japan. The openings, ending and other two themes were collected into the CD soundtrack The Best of TV Animation Slam Dunk, released on July 21, 2003. Four films were produced by Toei Animation from 1994 to 1995 while the manga and TV series were still running. They contain largely new material that is either only hinted at or is not presented in the manga. From August 1 to 4, 2006, NHK broadcast all four movies as part of its satellite networks NHK BS-2's Summer Anime Choice line-up, and TV Osaka aired the last three movies from January 3 to 8, 2007. All the films were collected into a DVD box named Slam Dunk The Movie which was released on December 10, 2004. The first film, simply titled Slam Dunk, premiered on March 12, 1994. Set after Shohoku's practice game against Ryonan, the film focuses on a practice game against Takezono High. Before the game, Sakuragi runs into Yoko Shimura, the girl who rejects him in the very first scene of the series, and Oda, the basketball player she rejected him for. Zenkoku Seiha da! Sakuragi Hanamichi,[a] released on July 9, 1994, is the second film from the series. It happens during Shohoku's 4th Round Qualifying game against Tsukubu High. The film features original characters including Godai, an old friend of Akagi and Kogure's, Rango, a wild show-off who is in love with Haruko and quarrels with Sakuragi, and Coach Kawasaki, a former pupil of Anzai-sensei. Shohoku Saidai no Kiki! Moero Sakuragi Hanamichi[b] was released on March 4, 1995. Set after Shohoku's loss to Kainan, and during a practice match against Ryokufu High. Hoero Basukettoman Tamashii!! Hanamichi to Rukawa no Atsuki Natsu,[c] which was released one June 15, 1995, tells that Rukawa's middle school kouhai Ichiro Mizusawa will be paralyzed soon and wishes to have one last game against Rukawa. Numerous video games based on the series, mostly developed by Banpresto and produced by Bandai, have been published for the Japanese market. Two basketball sims titled Slam Dunk Gakeppuchi no Kesshō League[d] and Slam Dunk 2 were released for the Game Boy. The Super Famicom had three games, Slam Dunk: Shikyou Gekitotsu,[e] Slam Dunk 2: IH Yosen Kanzenban! !,[f] and SD Heat Up!!. Slam Dunk games have also been released for the Game Gear, Mega Drive, and Sega Saturn. A Slam Dunk coin-operated arcade game by Banpresto was released in 1995. Characters of the series also appear in the Nintendo DS games Jump Super Stars and Jump Ultimate Stars. Unofficial game modifications have been made by fans for NBA 2K13 (PC Version). The collected volumes of Slam Dunk sold over 100 million copies by 2004, and over 118 million by 2012. The title had more than 121 million copies sold by 2014 and is Shueisha's fifth best-selling manga series. In 1994, it received the 40th Shogakukan Manga Award for shōnen manga. Until it was broken in 2002, volumes 21 through 23 of Slam Dunk held the record for initial printing of a manga at 2.5 million copies. The imprint version of Slam Dunk: 10 Days After was popular, having initially ranked 6th and then 15th in Oricon's weekly ranking of manga. The first six volumes of the shinsōban edition of the original manga all reached the top eight of their release week, with the highest being the first volume at number two. The English translation of the series was listed as one of the best comics of 2008 by Publishers Weekly. Similarly, the Young Adult Library Services Association named the first volume one of its "Great Graphic Novels for Teens" in early 2009. The success of Slam Dunk is cited as an influence in the increased popularity of basketball among the Japanese youth during the 1990s. The Slam Dunk Scholarship program was created in 2006 by Inoue and Shueisha. The winning 17- to 18-year-old recipient receives a fully paid academic and athletic scholarship to a university-preparatory school in America if they pass the school's admission interview. In 2010, Inoue received special commendations from the Japan Basketball Association for helping popularize basketball in Japan and the scholarship program. In a poll of close to 79,000 Japanese fans for the 10th Japan Media Arts Festival in 2006, Slam Dunk was voted the #1 manga of all time. In the Japanese government's 2009 Media Arts 100 Poll of the public's favorite works of art of all time, Slam Dunk took first place in the manga division. In a survey from Oricon in 2009, it was ranked first as the manga that fans wanted to be turned into a live-action film. The anime adaptation has also been very popular in Japan. In TV Asahi's 2005 Top 100 Anime survey of multiple age groups, Slam Dunk ranked as the 8th most popular anime. In another poll from TV Asashi but developed by a website, the series ranked 10th. The home video release of the anime also had good sales, having appeared on Oricon's Japanese Animation DVD and Blu-ray rankings. ^ 全国制覇だ! 桜木花道, lit. "Conquer the Nation, Hanamichi Sakuragi!" ^ 湘北最大の危機! 燃えろ桜木花道, lit. "Shohoku's Greatest Challenge! Burning Hanamichi Sakuragi"
^ 吠えろバスケットマン魂!! 花道と流川の熱き夏, lit. "Howling Basketman Spirit!! Hanamichi and Rukawa's Hot Summer"
^ "Why Basketball is a Slam Dunk in Japan". Fiba.basketball. June 13, 2018. Retrieved February 9, 2019. ^ "The Official Website for Slam Dunk". Viz Media. Retrieved October 28, 2017. ^ Solomon, Charles (June 12, 2010). "Author profile: Manga artist Takehiko Inoue has hoop dreams". Los Angeles Times. Retrieved June 14, 2010. ^ Inoue, Takehiko (1996). "Afterword". Slam Dunk, Volume 31. Shueisha. ISBN 4-08-871839-9. ^ Aoki, Deb. "Interview: Takehiko Inoue". About.com. Retrieved May 11, 2009. ^ "Takehiko Inoue Talks about Visit to Kinokuniya". Comipress.com. February 2, 2008. Retrieved May 11, 2009. ^ Aoki, Deb. "Interview: Takehiko Inoue - Page 2". About.com. Retrieved May 11, 2009. ^ Sevakis, Justin (November 21, 2007). "Takehiko Inoue at Kinokuniya NYC". Anime News Network. Retrieved May 11, 2009. ^ Cha, Kai-Ming; MacDonald, Heidi (November 26, 2007). "Takehiko Inoue Unveils Mural at New Kinokuniya". Publisher Weekly. Archived from the original on December 26, 2007. Retrieved November 5, 2009. ^ a b "Slam Dunk 10 Days After Epilogue's Reprint Confirmed". Anime News Network. January 24, 2009. Retrieved January 24, 2009. ^ "Works from Takehiko Inoue". Takehiko Inoue official website. Archived from the original on October 2, 2007. Retrieved April 28, 2009. ^ "Slam Dunk/1" (in Japanese). Shueisha. Retrieved October 17, 2008. ^ "Slam Dunk/31" (in Japanese). Shueisha. Retrieved April 28, 2009. ^ "Slam Dunk 完全版/1" (in Japanese). Shueisha. Retrieved April 28, 2009. ^ "Slam Dunk 完全版/24" (in Japanese). Shueisha. Retrieved April 28, 2009. ^ "SLAM　DUNK　新装再編版　1" (in Japanese). Shueisha. Retrieved June 6, 2018. ^ "Raijin Comics". Gutsoon!. Archived from the original on May 19, 2004. Retrieved April 28, 2009. ^ "Slam Dunk Volume 1 (Paperback)". Amazon.com. Retrieved May 11, 2009. ^ "Slam Dunk Volume 5 (Slam Dunk (Gutsoon))". Amazon.com. Retrieved April 28, 2009. ^ "Raijin on hiatus". Gutsoon!. Archived from the original on June 4, 2004. Retrieved April 28, 2009. ^ "SJ Runs Yu-Gi-Oh's End, Slam Dunk's Debut, Naruto's Origin". Anime News Network. November 5, 2007. Retrieved April 28, 2009. ^ "Viz Media Announces Biggest Issue Ever Of Shonen Jump". Comipress.com. November 2, 2007. Retrieved April 28, 2009. ^ "Slam Dunk, Vol. 1". Viz Media. Retrieved October 17, 2008. ^ "USA's Shonen Jump Replaces Hikaru no Go with Slam Dunk". Anime News Network. February 11, 2008. Retrieved April 28, 2009. ^ "Shonen Jump USA Drops Hikaru no Go for Slam Dunk". Comipress.com. February 20, 2008. Retrieved April 28, 2009. ^ "Slam Dunk, Vol. 31". Viz Media. Retrieved January 4, 2015. ^ "Slam Dunk - Property info". Toei Animation. Archived from the original on May 12, 2009. Retrieved May 12, 2009. ^ "SLAM DUNK VOL.1 DVD" (in Japanese). Amazon.com. Retrieved May 13, 2009. ^ "SLAM DUNK VOL.17 DVD" (in Japanese). Amazon.com. Retrieved May 13, 2009. ^ "SLAM DUNK DVDコレクション VOL.1" (in Japanese). Amazon.com. Retrieved May 13, 2009. ^ "SLAM DUNK DVD-Collection Vol.3" (in Japanese). Amazon.com. Retrieved May 13, 2009. ^ "SLAM DUNK DVD-Collection Vol.2" (in Japanese). Amazon.com. Retrieved May 15, 2009. ^ "Toei Announces First Releases". Anime News Network. November 23, 2004. Retrieved May 13, 2009. ^ "Toei DVDs Cancelled". Anime News Network. September 18, 2006. Retrieved May 13, 2009. ^ "Slam Dunk, Vol. 1". Amazon.com. Retrieved May 13, 2009. ^ "Slam Dunk, Vol. 4". Amazon.com. Retrieved May 13, 2009. ^ "First Slam Dunk Episode Streamed with English Subs". Anime News Network. June 4, 2008. Retrieved May 13, 2009. ^ "Toei Animation Adds Anime to Crunchyroll Website Today". Anime News Network. October 27, 2008. Retrieved May 12, 2009. ^ "Joost Streams All 101 Episodes of Slam Dunk". Anime News Network. May 1, 2009. Retrieved May 12, 2009. ^ スラム・ダンク (in Japanese). Amazon.com. Retrieved May 13, 2009. ^ スラムダンク ― オリジナル·サウンドトラック 3 '95サマー (in Japanese). Amazon.com. Retrieved May 13, 2009. ^ "THE BEST OF TV ANIMATION SLAM DUNK - Single Collection". CDJapan.co.jp. Retrieved May 13, 2009. ^ a b "Slam Dunk The Movie". Toei Animation. Archived from the original on May 13, 2009. Retrieved May 13, 2009. ^ "SLAM DUNK THE MOVIE DVD" (in Japanese). Amazon.com. Retrieved May 13, 2009. ^ "映画 アニメ SLAM DUNK　(1994)" [Theatrical Anime: Slam Dunk (1994)] (in Japanese). AllCinema Movie & DVD Database. Retrieved June 17, 2013. ^ "映画 アニメ SLAM DUNK　全国制覇だ！桜木花道" [Theatrical Anime: Slam Dunk Conquer the Nation, Hanamichi Sakuragi!] (in Japanese). AllCinema Movie & DVD Database. Retrieved June 17, 2013. ^ "映画 アニメ SLAM DUNK　湘北最大の危機！燃えろ桜木花道" [Theatrical Anime: Slam Dunk Shohoku's Greatest Challenge! Burning Hanamichi Sakuragi] (in Japanese). AllCinema Movie & DVD Database. Retrieved June 17, 2013. ^ "映画 アニメ SLAM DUNK　吠えろバスケットマン魂！！花道と流川の熱き夏" [Theatrical Anime: Slam Dunk Howling Basketman Spirit!! Hanamichi and Rukawa's Hot Summer] (in Japanese). AllCinema Movie & DVD Database. Retrieved June 17, 2013. ^ スラムダンクがけっぷちの決勝リーグ (in Japanese). Amazon.com. ^ "Slam Dunk 2". GameSpot. Retrieved May 13, 2009. ^ "スラムダンク From TV animation 四強激突!!" (in Japanese). Amazon.com. ^ "Slam Dunk 2: IH Yosen Kanzenban!!". GameSpot. Retrieved May 13, 2009. ^ "Slam Dunk SD Heat Up!!". GameSpot. Retrieved May 13, 2009. ^ テレビアニメ スラムダンク 【ゲームギア】 (in Japanese). Amazon.com. ^ "テレビアニメ スラムダンク MD 【メガドライブ】" (in Japanese). Amazon.com. ^ テレビアニメ スラムダンク アイラブバスケットボール (in Japanese). Amazon.com. ^ "スラムダンク - キャラクター紹介". Nintendo. Retrieved September 12, 2012. ^ ジャンプアルティメットスターズファーストアルティガイド. Shueisha. 2006. pp. 183–184. ISBN 4-08-779392-3. ^ NBA 2K13 SlamDunk + Kuroko's Basketball Mod (Anime). NBA2K (January 5, 2013). Retrieved on 2014-05-12. ^ "Naruto is 5th Shueisha Manga with 100 Million+ Copies in Print". Anime News Network. April 26, 2010. Retrieved January 13, 2015. ^ "Top 10 Shonen Jump Manga by All-Time Volume Sales". Anime News Network. October 23, 2012. Retrieved January 13, 2015. ^ "Shueisha Media Guide 2014 少年コミック誌・青年コミック誌" [Boy's & Men's Comic Magazines] (PDF) (in Japanese). Shueisha. p. 2. Archived from the original (PDF) on April 30, 2014. Retrieved April 23, 2017. ^ 小学館漫画賞: 歴代受賞者 (in Japanese). Shogakukan. Retrieved August 19, 2007. ^ "One Piece breaks sales record". Anime News Network. July 10, 2002. Retrieved January 13, 2015. ^ "Japanese Comic Ranking, April 7–13". Anime News Network. April 15, 2009. Retrieved May 11, 2009. ^ "Japanese Comic Ranking, April 14–20". Anime News Network. April 22, 2009. Retrieved May 11, 2009. ^ "Japanese Comic Ranking, May 28-June 3". Anime News Network. June 6, 2018. Retrieved June 6, 2018. ^ Ermelino, Louisa (November 3, 2008). "PW's Best Books of the Year". Publishers Weekly. Archived from the original on September 12, 2009. Retrieved June 17, 2013. ^ "Librarians Honor Sand Chronicles, Real, Uzumaki, Japan Ai". Anime News Network. January 28, 2009. Retrieved January 13, 2015. ^ "スポーツとメディアの関係性 (Relation between sports and media)". students of Rikkyo University. Archived from the original on July 3, 2006. ^ "First Slam Dunk Basketball Scholarship Awarded". Anime News Network. October 3, 2007. Retrieved January 13, 2015. ^ "Japan Basketball Association Awards Slam Dunk's Inoue". Anime News Network. June 9, 2010. Retrieved June 17, 2013. ^ "Top 10 Anime and Manga at Japan Media Arts Festival". Anime News Network. Retrieved November 24, 2006. ^ "Slam Dunk's Inoue Wins Japanese Government Prize". Anime News Network. March 8, 2009. Retrieved May 11, 2009. ^ "Survey: Slam Dunk Manga is #1 Choice for Live-Action (Updated)". Anime News Network. May 3, 2009. Retrieved May 11, 2009. ^ "TV Asahi Top 100 Anime Part 2". Anime News Network. September 23, 2005. Retrieved September 23, 2005. ^ "TV Asahi Top 100 Anime". Anime News Network. September 23, 2005. Retrieved April 15, 2009. ^ "Japanese Animation DVD Ranking, September 17–23". Anime News Network. September 25, 2008. Retrieved September 23, 2005. ^ "Japanese Animation DVD Ranking, October 21–28". Anime News Network. October 30, 2008. Retrieved September 23, 2005. ^ "Japan's Animation Blu-ray Disc Ranking, January 5–11". Anime News Network. January 13, 2015. Retrieved January 13, 2015. ^ Former Bruin is now Japan’s J.R. Sakuragi, Los Angeles Times, January 21, 2008.